Daniel Goleman: How Emotionally Intelligent Are You? As the HBR editors recognize, emotional intelligence is an active ingredient in great leadership. But how do you know your level of emotional intelligence? First of all, you should understand that, unlike IQ, no one can summarize your EQ in a single number. Know someone with great self-confidence, but zero empathy, for example? Nested within each of those four areas are specific, learned competencies that set the best leaders and performers apart from average. Emotional Awareness: Recognizing one’s emotions and their effects. Accurate Self-Assessment: Knowing one’s strengths and limits. Self-Confidence: A strong sense of one’s self-worth and capabilities. Emotional Self-Control: Keeping disruptive emotions and impulses in check. Transparency: Maintaining integrity, acting congruently with one’s values. Adaptability: Flexibility in handling change. Achievement: Striving to improve or meeting a standard of excellence. Initiative: Readiness to act on opportunities. Optimism: Persistence in pursuing goals despite obstacles and setbacks. Empathy: Sensing others’ feelings and perspectives, and taking an active interest in their concerns. Organizational Awareness: Reading a group’s emotional currents and power relationships. Service Orientation: Anticipating, recognizing, and meeting customers’ needs. Developing Others: Sensing others’ development needs and bolstering their abilities. Inspirational Leadership: Inspiring and guiding individuals and groups. Change Catalyst: Initiating or managing change. Influence: Wielding effective tactics for persuasion. Conflict Management: Negotiating and resolving disagreements. Teamwork & Collaboration: Working with others toward shared goals. Creating group synergy in pursuing collective goals. You can use this as a rough personal checklist if you like. But we are not always the best judge of our own strengths and limits. If you want the best appraisal of your own abilities, I recommend getting a 360-degree look. One way is with the ESCI-360, which I co-designed with my colleague Richard Boyatzis at Case Western and Hay Group. It’s based on this competency list, and will guide you through a process (best done with a coach), that will help you gain more strength. We don’t have a fixed profile of emotional intelligence – it’s an ability that can change throughout life. That’s why the ESCI-360 and similar measures of emotional intelligence are best used working with a coach. Plus, it’s never too late to get better – if you are motivated. That’s good news for anyone who wants to get better at this set of success skills. 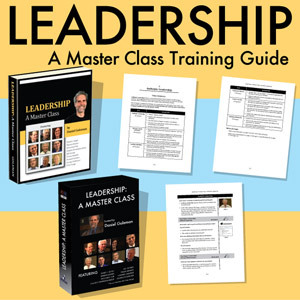 Apply these concepts into your training program with Leadership: A Master Class Training Guide. The collection offers more than nine hours of research findings, case studies and valuable industry expertise through in-depth interviews with respected leaders in executive management, leadership development, organizational research, workplace psychology, innovation, negotiation and senior hiring. Daniel Goleman: Are You a Great Multitasker? Daniel Goleman: What Makes For a Happy, Productive Workplace?